I am a huge fan of The Hunger Games. I've been rereading the books, I've already got my ticket to the movie, and now I've purchased the entire nail polish line. I am obsessed!! I read about this line months and months ago. 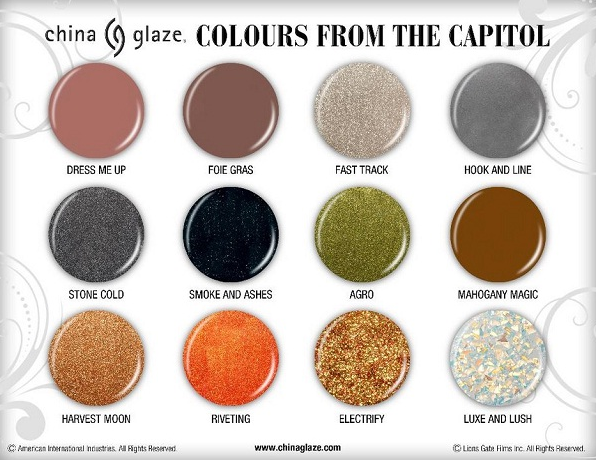 Apparently the color palette was leaked before China Glaze and the people behind the movie (Lionsgate?) had made an official deal, which caused a huge panic, and the companies decided not to make the polishes. 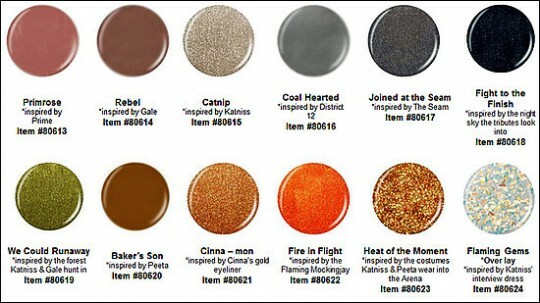 THANKFULLY, a couple months later they came to their senses and released the current palette (same colors, crappier names). What a lot of drama about nail polish!! Original names - I like them waaaaay better. New names, one for each of the Districts.